Here’s some modestly good news to start your day. (Or, if you’re on the East Coast, to start your lunch hour.) 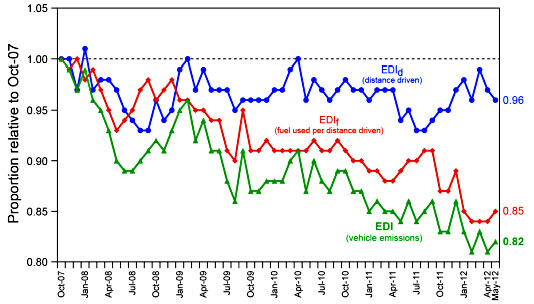 Carbon emissions from US vehicles are down considerably over the past few years. This is due to a combination of less driving and more efficient vehicles. The chart below, from the University of Michigan’s Transportation Research Institute, tells the story. And things will get even better over the next decade, as the Obama administration’s program to increase average fuel economy to 54.5 mpg kicks in. It’s not enough, but it’s something.